What’s especially interesting there, is that in all of these missions, except for Iraq, the U.S. was doing it with the key participation of the Saud family, the royals who own Saudi Arabia, and who are the world’s largest buyers of American weaponry. Since Barack Obama came into the White House, the operations — Libya, Yemen, and Syria — have been, to a large extent, joint operations with the Sauds. ‘We’ are now working more closely with ‘our’ ‘friends’, even than ‘we’ were under George W. Bush. When issues of global concern do not pose a direct threat to the United States, when such issues are at stake — when crises arise that stir our conscience or push the world in a more dangerous direction but do not directly threaten us — then the threshold for military action must be higher. In such circumstances, we should not go it alone. Instead, we must mobilize allies and partners to take collective action. We have to broaden our tools to include diplomacy and development; sanctions and isolation; appeals to international law; and, if just, necessary and effective, multilateral military action. In such circumstances, we have to work with others because collective action in these circumstances is more likely to succeed. So: ’we’ didn’t achieve these things only on our own, but instead in alliance with the royals of Saudi Arabia, Qatar, UAE, Kuwait, and other friendly countries, which finance jihadists everywhere but in their own country. And, of course, all of ‘us’ are allied against Russia, so we’re now surrounding that country with ‘our’ NATO partners before we do to it what we’ve previously done to Iraq, Libya, Yemen, and Syria. America is becoming even more ambitious, because of ‘successes’ like these in Iraq, Libya, Syria, Yemen, and Ukraine. The United States has been the great champion of ‘democracy’ throughout the world. And these are are some of the results of that ‘democracy’. ‘We’ are spreading it abroad. ‘Our’ latest victory has been ‘our’ spreading it to Ukraine. No country is closer to Russia than that. Inside America, the term that’s used for referring to anyone who opposes this spreading of ‘democracy’, is ‘isolationist’, and this term is imported from the meaning that it had just prior to America’s joining World War II against Hitler and other fascists. Back in that time, an “isolationist” meant someone who didn’t want to defeat the fascists. The implication in the usage of this term now, is that the person who is an ‘isolationist’ is a ‘fascist’, just as was the case then. It’s someone who doesn’t want to spread ‘democracy’. To oppose American foreign policy is thus said to be not only ‘right wing’, but the extremist version of that: far right-wing — fascist, perhaps even nazi, or racist-fascist. (Donald Trump is rejected by many Republicans who say that he’s ‘not conservative enough’. Democrats consider him to be far too ‘conservative’. 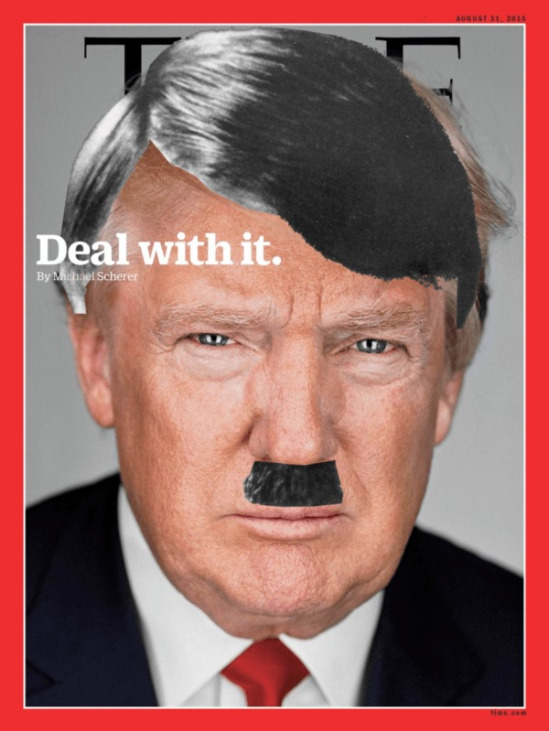 The neoconservative Democrat Isaac Chotiner, whom the Democratic neoconservative Slate hired away from the Democratic neoconservative The New Republic, has headlined at Slate, “Is Donald Trump a Fascist?” and he answered that question in the affirmative.) George Orwell dubbed this type of terminological usage “Newspeak.” It’s very effective. Studies in America show that the people who are the most supportive of spreading ‘democracy’ are individuals with masters and doctoral degrees (“postgraduate degrees”). Those are the Americans who vote for these policies, to spread American ‘democracy’, to foreign lands. They want more of this — more of these achievements. (Hillary Clinton beat Bernie Sanders nationwide among the “postgraduate” group.) Some of these people pride themselves on being “technocrats.” They claim that the world needs more of their ‘expertise’. Lots of them come forth on the ‘news’ media to validate such invasions as Iraq in 2003, Libya in 2011, Syria after 2011, etc. Almost all of them possess doctoral degrees. This shows what they have learned. They are the most employable, the highest paid, the most successful, in their respective fields. After all: ‘democracy’ is not for amateurs. It’s only for people who take instruction, and who do what they are told. But, told by whom? Whom are they obeying? Do they even know? In any organization, when an instruction is issued, is it always easy to know who issued it? And what happens to a person who doesn’t carry it out? There is a winnowing process. The constant survivors are the ones who rise from that process, and who ultimately win the opportunity to issue some of the instructions themselves. These people are the wheat; everybody else is chaff, which gets discarded, in a ‘democracy’.